Unearth is a new boutique on New BEL Road that multi-tasks as a nursery as well as a home decor store. Gorgeous terrariums and classy planters are their speciality. Go make your work desk or living room a better place! 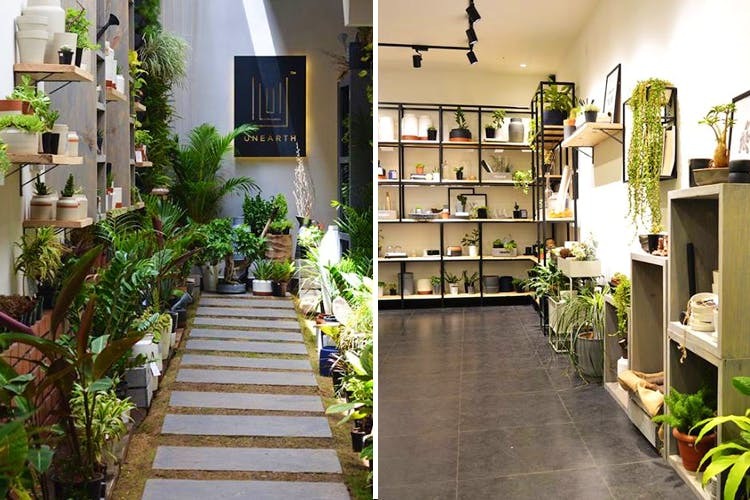 Unearth is a minimalistic yet gorgeous store that’s looking to add a touch of green to your space. They specialise in home decor pieces that feature terrariums and other plant life. So, expect handmade terracotta jars and pots that can brighten up your workspace or your kitchen or even your bathroom. They also have plenty of wooden and steel planters that can sit pretty in a cosy nook at your home or office. We are in love with the minimalistic Ikea-like aesthetic. We also love their delicate glassware. Jars with elegant mouths that house cacti and other succulents, glass capsules that can be hung around your living space, and also bulb shape planters. Their products are priced between just INR 290 and INR 5,000. What we love is the fact that how each and every piece here might add to the nook of your home without overcrowding it. Indoor plants are a common feature at the store. They’ve got them in all shapes and sizes so you can pick what goes best with your space.